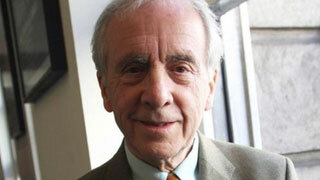 Earlier this month, Fawlty Towers fans were shocked and saddened to learn of the death of Andrew Sachs. The 86-year-old, who played the perpetually dazed and confused Spanish waiter, Manuel, died November 23rd, after a four year struggle with dementia. The last eight months of the diminutive actor’s life were spent in a care home for retired actors, where he’d been admitted this past summer suffering from pneumonia. Despite his illness, which at the end left Sachs wheelchair-bound and unable to speak, his wife of 57 years, was almost constantly at his side. According to an interview Mrs. Sachs gave the night before her husband’s burial, she never once heard her husband grumble. “I never found him once without a smile on his face”, she said. “We laughed because we’re both silly. We’re both as daft as brushes”. Sachs, who was born in Berlin in 1930, fled to England with his family when he was eight years old after his Jewish father had been arrested by the Nazis. Although released on the invention of a friend in the police force, the family feared for their lives and so settled in London, where Sachs made his home for almost eight decades. 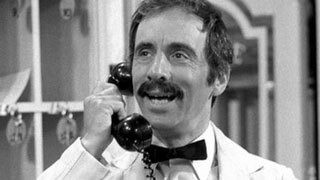 It may have been Sachs’ German heritage that made him try to convince Fawlty Towers creator John Cleese to let him play Manuel as a German, but Cleese ultimately decided that a waiter from Munich would be far too efficient and not provide half as many laughs. Cleese’s instincts proved to be on the mark, and despite there being just twelve episodes of the series made, Sachs' befuddled, much put-upon waiter "from Barcelona" became a sitcom icon. Basil’s constant abuse of Manuel might have made us laugh, but it sometimes proved perilous for Sachs. He was once hit over the head by Basil with a real metal saucepan – he’d thought it was going to be a rubber one. Another time, The Germans kitchen fire episode, Sachs was doused with a corrosive chemical designed to emit smoke, but it ate through his clothing and he suffered second degree acid burns. For the injuries Sachs received that day, the BBC compensated him the grand sum of £700 (about $1,000). Sachs’ relationship with the BBC was a long one. He first acted at the BBC in their Sunday Night Theatre series in 1959 and he went onto appear in numerous BBC radio and television productions, including The Saint. His film career dated back to 1947 when he played a schoolboy in two Ealing Studio films. The roles weren’t credited, but by the late 1950s, he was making a stable living appearing on stage, screen and television. It wasn’t for a couple more decades though that Sachs became well known with the first episode of Fawlty Towers in 1975. Despite his illness, which was kept private until after he had died, Sachs continued to work right up until last year. In 2009, he had added "soap opera actor" to his list of credits when he joined the cast of Coronation Street, where he appeared in 27 episodes. In 2015 Sachs returned to the BBC to co-star in just two episodes of EastEnders. The character he played was brought in to be involved in a major storyline involving the character played by actor Timothy West, whose wife Prunella Scales played Sybil in Fawlty Towers. You might recall that it was a year ago that West revealed that Scales had also been diagnosed with dementia. Sachs’ last film role was in 2012 in one my favorite films, Quartet, about a home for retired musicians. The film also stars Maggie Smith, Dustin Hoffman, Michael Gambon, Tom Courtney and Pauline Collins. Sachs was buried on December 1st. The following day, the BBC celebrated the comic genius of the actor who in a tribute to him John Cleese called a "sweet, sweet man", with the re-airing of the Fawlty Towers episode "Communication Problems".